Located in the foothills of the Himalayas, Rishikesh is a scenic place in Uttarakhand. Be it summers or winters, thousands of people from across the world throng this city. There are numerous temples here that combined with the presence of the Ganga River, make it one of the most significant spiritual places in the country. The natural beauty of the city, with the river flowing through and lush Shivalik Hills in the distance, itself draws hordes of tourists. This is not all, as the city is also visited by those who like to indulge in adventure sports. All this has led to a tremendous increase in the number of hotels in Rishikesh that remain packed with holidaymakers round the year. These range from luxurious resorts to budget hotels in Rishikesh that offer comfortable stay. If you are going for the latter option, then FabHotels is the best bet. With over 275 hotels in 25+ cities in India, it is one of the largest and rapidly expanding hospitality brands in the country. All our hotels feature contemporary rooms with modern amenities for a pleasant stay. We have dedicated customer support, which works round-the-clock to assist guests in every possible way. The best thing about holidaying in Rishikesh is that tourists have a wide choice of things to do. They can simply relax at the hotel, admiring the surroundings and enjoy the cool weather. The hills all around the city offer numerous opportunities for short and easy hikes. Due to the high-octane activities organized here, Rishikesh is often called the Adventure Capital of India. One of the most popular things to do here is white water rafting on the Ganga River. The downstream journey starts from four places near the city: Shivpuri, Brahmpuri, Marine Drive and Kaudiyala, ending at the famous Lakshman Jhula. If you are looking for pocket-friendly hotels near Shivpuri, then FabHotel The Narayana Palace is a good option. Apart from well-equipped rooms, it also has an outdoor swimming pool, which is a perfect place to relax. Another activity to try in Rishikesh is bungee jumping in the village of Mohan Chatti. Located on the banks of a Ganga River tributary, the bungee jumping platform is 83 meters high! The same platform is used for giant swing, where you jump and keep oscillating till the energy conversion in the elastic cord stops. You can also try zip-lining and flying fix across the river for an adrenaline rush. Apart from trying adventure sports, you can also visit Triveni Ghat, Trayambakeshwar Temple and Neelkanth Mahadev Temple. Walking on the Lakshman Jhula and Ram Jhula would be a fun experience as the suspension bridges will sway left and right while you walk. You can also attend the evening aarti on the banks of the Ganga River. There are several yoga institutes, meditation centers and ashrams you can head to for a spiritual session. Due to the prominence of Rishikesh among spirituality seekers, there are loads of markets and shops here that sell religious artifacts like idols of deities and ritual objects. Ram Jhula Market is a good place to shop for these as across the bridge is Swargashram Bazaar. Those, who are looking for jewelry or clothes, can make their way to Lakshman Jhula market. Rishikesh Main Market has stores offering everything from handicrafts to items of daily use. When it comes to dining, the number and variety of restaurants in the city are vast. Devraj Coffee Corner, Little Buddha Café, Chatsang Café, Pyramid Café, Oasis Restaurant, Madras Café, Bistro Nirvana, Tip Top Restaurant, Freedom Café, German Bakery, Ganga Beach Restaurant, Tulsi Restaurant, Chotiwala, Café Karma, Rajasthani and Honey Hut are some good picks. You can also head to Native Taste, 60s Café, Ayurpak, Bistro Nirvana, Café Delmar and Green Italian Restaurant. In recent years, the biggest event to be held in Rishikesh has been the International Yoga Festival. This year, it will be organized from March 1-7 at Parmarth Niketan Ashram, located on the banks of the Ganga River. It will include yoga classes, lectures by eminent personalities in the field, evening Ganga aarti and cultural performances. The yoga sessions and lectures will begin at 4:00 am and go on till 5:00 pm. Apart from yoga preachers from across the world, the 2018 International Yoga Festival will also be graced by His Holiness, the 14th Dalai Lama. 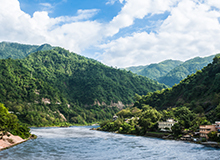 As Rishikesh is a popular travel destination, it is well connected to all parts of the country. The major roads linking it to the rest of India are National Highways 7 and 34. The nearest railhead is in Haridwar, around 22 km away. It has direct trains to and from Delhi, Dehradun, Madurai, Varanasi, Indore, Ujjain, Amritsar, Jammu City, Udaipur, Allahabad, Gorakhpur, Ahmedabad and Mumbai. Jolly Grand Airport in Dehradun (21 km) is the primary air transit hub for Rishikesh. The nearest international airport is the Indira Gandhi International Airport in Delhi (245 km). If you are staying in the Indian capital as well, then you have a number of hotels in Delhi to choose from. Among the most booked budget hotels in Delhi are FabHotel Cabana and FabHotel Tryfena. "Beautiful hotel courteous staff good location." "polite staff food was tasty and staff is always smily Face"
"beautiful HOTEL with garden with feel like away from Home"
"Staff is very humble and helpful. It was indeed one of the best properties I have stayed in." "The staff were very polite and helpful." "Lovely staff who are very helpfulllllll." "Loved the restaurant and the staff working in it." How camping in Rishikesh is the best way to come back completely rejuvenated?